Hey kids! You’ve made your way back to Kids Corner, the #1 island blog written by kids, for kids. I’m here to talk about one of the best Asian food places on the island, Ocean Star. Not only does it have awesome food, but the atmosphere is very realistic and entertaining. Read on if you want to learn more. 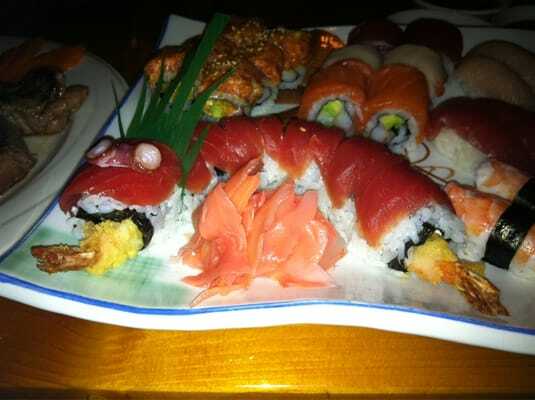 Ocean Star is this great sushi and Japanese food restaurant located at the Galati Marina. It h as the most yummiest sushi and dumplings you’ve ever tasted. And no matter what you like there’s something on the menu to amuse everyone. So let’s start with the food. Honestly, I would have to say that sushi is their specialty. My favorite has to be the Hawaiian Role-Tuna and Cream Cheese tempura with eel sauce-soooo good! I mean, the other items I have tried on the menu were fantastic, don’t get me wrong, but I think the thing they spend more time perfecting their sushi than anything else. But if you’re not exactly the sushi type, Ocean Star has plenty of other options for you. They make a variety of tempura dishes (fried veggies and fish – finger food that satisfies even people like my brother). They also serve many different types of rice, dumplings, soups, noodles, and even steak, to satisfy your hunger. So feel free to eat up and enjoy! Next, the atmosphere. As soon as you walk in the door, it’s as if you’ve entered a whole different world. In short, it’s very different than your everyday mealtime. You can eat at a table, in a booth, at the bar, or in a canopied-in booth with strips of seating area all around the table. To add to the realistic Japanese ambiance, the lights are dim and the chefs are constantly preparing food right in front of you, which adds to the awesome mood. So, to conclude, Ocean Star is a fun, awesome restaurant that serves great food, has a fantabulous atmosphere, and is a great place to eat whether you have a special event or are just looking for a cool place to eat for dinner or lunch. Well, i gotta go. See ya l8tr. Byeeeee!!!!!!!! 5pm – 10 pm live music, arts & crafts, Skate Park, children’s play area, Island food court, and a car show. Everyone needs to eat and when you are in Holmes Beach on Anna Maria Island you must stop at Hurricane Hanks Pub & Grub for lunch or dinner. Hurricane Hanks is in the S & S Plaza located at the intersection of Gulf Drive and Marina Drive in Holmes Beach. This island style pub has it all, salads, sandwiches, steaks, seafood, and a full liquor bar, with bartenders who know their drink recipes.